Ah, Fables. Writing about you without a) repeating myself endlessly and b) spoilers has become a nearly impossible task. But once again, I'm going to try. The Dark Ages marks the beginning of a new main story arc in this series. The Adversary has been defeated, and the characters we know and love are both celebrating their triumph and recovering from the final battle. But as you can imagine, the celebrations don't last long. Very soon, Fabletown discovers it's being threatened by a new enemy. I’ll join my voice to the chorus of those who have said that The Dark Ages is not among the strongest Fables volumes. But! It’s still Fables! I’m so invested in this series that at this point it would take a major storytelling disaster for me to be completely unsatisfied. And The Dark Ages may be many things, but a disaster it is not. It does have its problems, however, and one of them is that it feels a little rushed. Did we really need a new villain to be introduced so soon? Wouldn't a volume that simply dealt with the aftermath of the battle while hinting at things to come have been more satisfying? The villain introduced here seems to come a bit out of nowhere, to be honest. And worse than that, the way he’s introduced doesn’t leave much room for suspense. We know he’s a threat, we know the nature of the threat, and we know that our dear Fables had better run for their lives. But threats of an unknown nature are always a little more interesting, as are ambiguous villains, or those we can’t quite figure out. This was precisely what made the first story arc of Fables so exciting, so part of me has faith that perhaps this Mr Dark will surprise us yet. I really can't say more without spoilers, I'm afraid. The Dark Ages is not the best Fables book, but it’s Fables, so I'm happy to have read it all the same. I look forward to seeing where the story is going next. Question time: How do you deal with reviewing series? Do you write about them one volume at a time or, if all volumes are out, do you simply read them all and then write one post about the whole thing? Do you give up after a while? Do you worry you're repeating yourself? And how do you handle spoilers? Am I the only one who frets about these things? I haven't read any of this series, but I'm in the mood for just this sort of thing right now. I love fairy tale characters transformed by another's imagination. Pretty bad that you have reviewed this and I still haven't! I have not heard of this before, but really like the cover. Great review! I haven't read this but your review is great and the cover to die for....love it. Series definitely present a problem with spoilers, because talking about later books spoils it for those who haven't started the series yet. I end up saying not very much at all, which doesn't make for a very interesting review (in my case, anyway!). I like the way some bloggers put spoiler sections in white, so you have to (un)block them with your mouse to see what's written there. Or at least putting in a big header identifying that spoilers are ahead! I think it is important not to ruin a whole series for someone who hasn't started yet. But reviewing such books is an art form! I would probably attempt more mini reviews as a series progresses. That way you cannot give too much away. Another series of books I have yet to discover. I keep hearing about the Fables books. Something to look forward to next year. Personally, I HATE reviewing series :p Especially with graphic novels...I usually review the first one and then don't review any more of them...or I'll review them all together if it's something like Scott Pilgrim and I read all 5 back to back. But with Fables, it really is rough! Same with Bone!! You do a fantastic job though..better than I could ever do! I'm ridiculously behind on my Fables reading since I've been on a total book buying halt. However, I can't wait to get back into it, and now I have to know what this new arc will entail! I'm having this exact problem with my Harry Potter Re-Read Challenge. I've made it through three of them - and I've reviewed the first one. Since everyone either knows the story or doesn't want it spoiled if they don't - I feel like I can't really say much at all about them. Most likely, I'll do a wrap-up post at the end - going over all of them. I went to the bookstore last night and saw a hard cover compilation of like the first 5-10 or something and almost bought it thanks to you and some other bloggers. $30 though. I wish graphic novels weren't so expensive. I understand why they are. They are a whole lot of work. They can be absolutely beautiful. They're art. I just want a $30 book to take at least 6 hours to read. After reading your review of the first book in this series, I went out and bought it. I still haven't had the time to read it yet, but both my kids really loved it. Hopefully I will be getting to it soon and getting further into the series. As far as my reviews for books in a series, I have only done one, and I waited until I was finished with all 3 books and posted a triple review. It might have been a bit easier because all 3 books were housed in one volume. I have been asking myself the same question and wondering which approach I will take. I am interested in seeing how you handle this though because I might learn something. Ah yes ... the series "question." You are not the only one who frets about how/if to review series. So far, I've not reviewed many books in series. In fact, I may have only reviewed one series (The Gregor books by Suzanne Collins) and I created one post and wrote very short blurbs for each title. I did this since the series was complete at 5 titles. I'm just not sure how best to go about reviewing these books yet. Every time I sit down and start writing, the darn review I end up writing gives away too much and when I go back and cut out spoilers I seem to end up with something along the lines of "a great series for those who like regional mysteries" or some such thing. Sigh. I haven't read this series but am getting to know them through your reviews. Thanks for that! I wasn't sure how to review series too (I probably still am). I tried to review just the first one with Bone and skipped the second one, but then I got a bit sad because each volume should be precious -- well for more practical reason, I often forget what happens in which volume etc. Anyway my blog started as a reading journal, so I'm thinking to keep writing at least a little bit on each volume. The first review should be the longest and the most thorough and the rests should be pretty short, unless it's very special. It may not be interesting for people who haven't read the series at all, but hell, can't make everybody happy, can I? Well, the cover is beautiful. I have to admit, I kind of skimmed your review!!! I've only read the first 2 books in this series, though I have the 3rd one at home. Just waiting for some quiet time!! I can't even begin to describe how much I love these books!! My 2nd-grader (Ana), who reads at a 5 - 6th grade level, has been trying to steal these from me! I keep telling her they are a little to old for her, but she is not easily discouraged! I'm going to have to hide them! She likes the idea of Mommy reading books about Snow White and Rose Red and such!! You may hate reviewing books in a series, but I have to tell you that I am always in awe of how well you do it! Seriously, Ana. I'm glad I've told myself read-a-thon day is free from my damn self-imposed reading restrictions (though I get more and more tempted to drop those altogether), because you have really made me want to dive back into this series! Luckily I do have four more on the shelf unread, so the buying ban won't be rearing its ugly head. I've liked Fables less and less as the series has gone on, but I'll give The Dark Ages a try and see how it is. Jenclair, I think you'll love Fables! Jenny: I know what you mean. But I hope that he'll surprise us yet. Joanna: Awesome! :D Can't wait to hear what you think. Diane: The art in Fables is to die for in general! Vivienne: Mini-reviews are definitely a good idea. I hope you enjoy Fables! Lena: A wrap-up post at the end sounds like a good plan! Cara: I completely understand! Even though I love comics and graphic novels, it's harder for me to invest in them than in other books because I know I'll be done with them so quickly. Sigh, I wish my library had them! Terri B: I'm glad to hear I'm not the only one who worries! Debi: Don't let those rules become too confining, Debi! And Fables=PERFECT read-a-thon material. Brenda: Sorry to hear that! This was actually the first volume that made me feel this way. Up until The Good Prince I felt that they were getting better and better. War and Pieces I didn't like as much, though, and the same goes for this. I can't believe I *still* haven't read any of the Fables book. Must correct that soon. I think I know the part where you say you were mad and I totally agree with you. I was SO MAD at Bill for doing what he did to who he did it to. (how's that for vague?) And the new villain was brought in a little fast, I agree, but wow is he creepy! I wish I knew what he is supposed to be; is he a new Fable they made up themselves or based on some obscure legend or story I have no knowledge of? Very confusing. But still love the series and can't wait for the next one! Have you read any of Jack's series yet? I can't remember. I usually skip reviews of series books unless it's the first book. I read the first and the last para max just to get an idea of whether it was liked or not. I had to try really hard to take my eyes off the cover to skim the review :) I need to start reading this series. I've heard good things about Fables. I need to get reading. I actually don't review this series I just read them. It seems like it would be too difficult to review so I just read and enjoyed. My series reviews are usually pretty short (especially for graphic novels), but I try not to worry too much about spoilers for previous volumes. I put the series position up towards the top, and figure that people who aren't at the same position that I am can read on at their own risk. For some odd reason I don't review series but I think I did review Fables 10: The Good Prince. 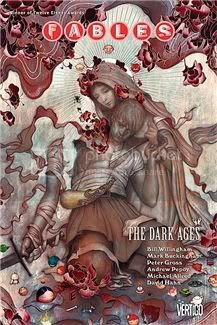 Should I buy The Dark Ages or just buy it? That was suppose to be "borrow". Should I buy it or borrow it? Beth, you must! I hope you love them. Heather: lol, exactly :P I still haven't read Jack of Fables, but with the crossover volume coming out next year, now's the time! As I was telling Kelly, I'll put them all on my Christmas/birthday list. Violet: You do! And I do the same. Andreea, it's one of my favourite comics series! Jen: It's the most recent one - it only came out about a month ago. And I think I'll do the same in the future regarding series. Vasilly: Hm...well, considering that you've enjoyed the series so much so far, I'd say get it. It's not a horrible book or anything, it just had a few pacing problems. Also, prepare to cry! Hmmmm... I'm still working on my Dark Ages post. I actually loved this one, because it raised the most questions. This is the first volume of Fables I read where, when I finished, I immediately went online and said "WHO HAS READ THIS! TALK TO ME!" because I needed to talk about it and discuss it. I agree with many of your criticisms of the volume, but the questions! oh! I'll hopefully get my post up soon. As for series and spoilers. Sometimes my series books reviews are really short. Sometimes, I hide them on my Spoiler blog. Sometimes, I put warning up that says "I'm reviewing a series book. While there aren't spoilers for THIS book, there will be some for previous books in the series."